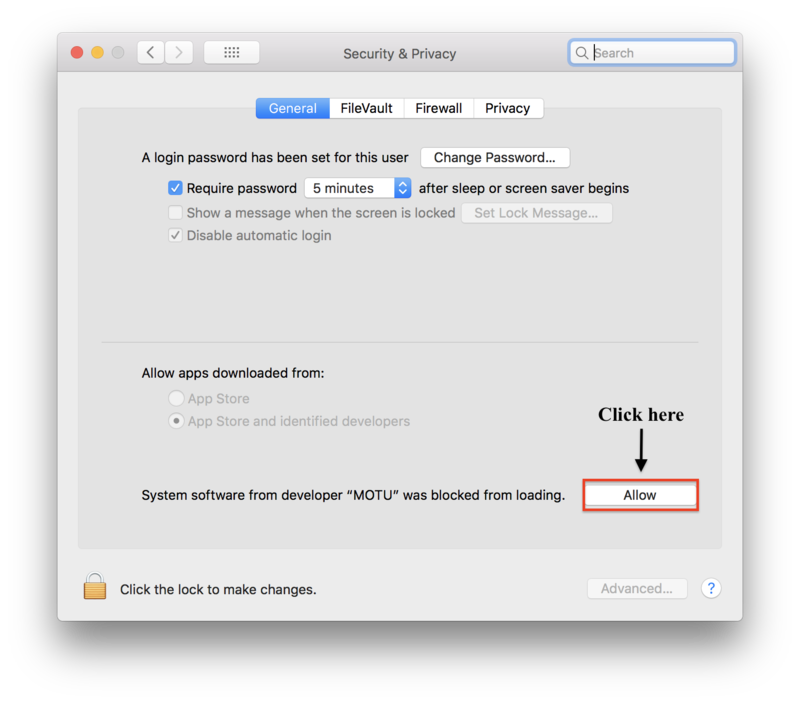 Due to the updated architecture of the new macOS Mojave, the system extensions for all newly-installed third-party software will automatically be blocked from running. If your MOTU interface is not showing up in Audio MIDI Setup, MOTU Audio Setup, the MOTU Discovery App, or your DAW on Mojave, you might need to enable the driver in your System Preferences. Download and install the very latest installer for your MOTU interface. After restarting, open System Preferences. In the General section, click the Allow button. The Allow button will disappear 30 minutes after installation. To display the Allow button, run the installer for the MOTU driver again. This behavior will only occur when installing a MOTU driver on Mojave for the first time. If you have installed the driver on a earlier version of macOS and then upgrade to 10.14, you should not need to enable the driver. This issue is not specific to MOTU. It is a general change introduced in Mojave and will affect any third-party (i.e. non-Apple) kernel extensions.